Not many cafes in Malaysia make their cappuccino or cafe latte with LATTE ART on them. The word LATTE basically means MILK. So latte art means art made with milk. Incidentally, many people went into Starbucks and asked for a latte not knowing that they were actually asking for MILK! Well, that how words lost their meaning. Perfectly meaningful words being mis-used. Back to the matter of latte art and cafes. The only cafes I know of that serve their milk-based drinks with latte art are Espressamente Illy and Segafredo Espresso. And I don’t mean those cafes that shows us latte art only when interviewed by journalists or when they appear on media, or those where latte art only appears on their menu. Seems like Espressamente Illy and Segafredo Espresso cafes are the only that serves with latte art on a regular basis. Well, at least 8 out of 10 times is good enough for me. Hey, if your cafe serves coffee with latte art, let me know. I want to come and try. Note: let me qualify… when I say latte art, I meant those free pouring latte art that shows a heart, an apple or a rosetta. NOT those who simple etched the surface with some chocolate sauce or colouring. Is LATTE ART important to a cup of coffee? I assure you that latte art does enhanced that cup of coffee. How? Firstly, enjoying coffee is a sensory experience. It involve our whole senses. One of the very few things I like about Starbucks is how very cozy is their environment. (they can’t make a good cup of cappuccino if their lives is depending on it) A nice cup of cappuccino with latte art shows how much care and details were put into making it. Latte art on coffee basically enhances 2 aspects of consuming coffee. It is pleasant to the eyes and sweetly smooth on the tongue. The fact that it is pleasing to the eyes is easy to understand, but there is another reason why it is lovely to the tongue. 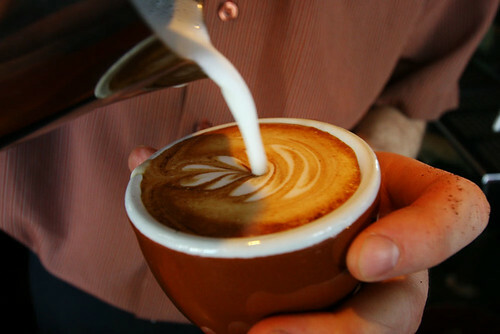 In order to pour latte art like this picture (not by me unfortunately), the milk need to be correctly frothed. The stretching amd texturing must be well done and temperature must be ideal. Actually, when you have correctly frothed milk, even without the art, it will still taste sweet and velvety. And when you add the art, wow… that is a lovely coffee experience. With lovely milk and art, it can turn a lousy cup of coffee to be bearable. A bearable cup to average and an average cup of cofee to decent. And if you have quality fresh roasted coffee to begin with, you can get a GREAT cup of coffee. Of yes, LATTE ART works on hot chocolate too. Finally: don’t go and whacked the barista in Espressamente Illy or Segafredo Espresso if your cappuccino does not come with latte art , ok. Consider it a bonus. It is a difficult skills and take time to learn, practice and perfect. This entry was posted in Cafe, Cappuccino, Coffee, Coffee Beans, Espressamente, Kuala Lumpur, latte, latteart, Malaysia, Segafredo Zanetti Espresso, Starbucks on April 17, 2009 by KF Chan. hey, i’m interested in a barista course in KL. i’d like to do one ASAP. are there any available classes or more information? hey,i want to know did any coffee/latte art shout course to learn it. can give some imformation.thank you..
Free espresso! I tried the Hazelnut dream along with my free espresso! Hit me up if anyone else has tried Mbuji? Its ok KF Chan…you should expect the perfect cup every time at Espressamente illy with awesome latte art! Dont expect anything less…..although no whacking needed…..cos the Corleone Whack back! hahaha.. I certainly would not want the Corleone family putting a hit on me man. But then, the coffee scene in Malaysia has changed a lot over the past 2 years. There are more than a handful of cafes serving coffee with latte art today. Hi, i loved coffee all these while but never went into deep interest till recently. How do you know whether it is a good or bad cup of coffee? Was it subjective? I were looking for beginner class for coffee making too, any idea where can I found them?